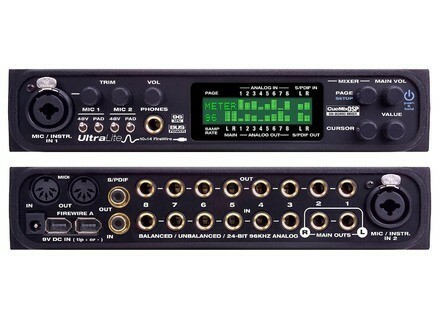 The Motu Ultra Lite is a simple, USB audio interface for use in home studios. This type of interface is a perfect way to start building your small home studio. It's definitely not going to be adequate for an sort of in depth recording, but if you're just looking to get some demos down it will do the job. There are a lot of audio interfaces out there like this, so definitely make sure to do your homework before deciding on one. The UA-25 in particular has two dual XLR-1/4" microphone preamps, each with their own gain knobs and a 1/4" headphone jack in the front. In the back it's MIDI and digital (ADAT) inputs and outputs as well as 1/4" and RCA outputs for your main monitors. It has built in phantom power and can support sample rates up to 96 K.
The sound of the mic preamps on the Motu Ultra Lite aren't all that great, but are suitable for laying down demos at the least. Those looking at the UA-25 most likely aren't going to need the best sounding preamps, and if you are I'd suggest you stop reading this review and look elsewhere! You probably couldn't make a professional sounding recording, but if you just want something with a few mic inputs to use in your DAW, the UA-25 sounds just fine for that. While there isn't too much that sets the Motu Ultra Lite apart, it's still a solid USB audio interface for very small home studios where you might have this and a microphone and your DAW basically.